The two angles given are vertical angles, so we know they have the same angle measure. 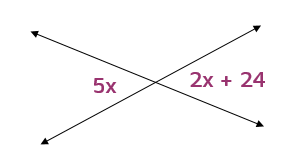 This means we can write an equation by setting the two expressions equal to each other. Do you learn better by watching? Check out the short video below. Ready to try answering a few questions on your own? Click the START button below.